This chapter discusses several technical changes related to the Internet—the social semantic web and linked data, the instrumentation of natural and social processes, big data and graphing analytics, and cloud-based facial recognition—and focuses on several threats resulting from these developments. As billions, or trillions, of everyday objects, including the human body itself, are equipped with sensors, a variety of new types of data will be collected, aggregated, and linked to other personally identifiable records. These changes transgress personal privacy boundaries and lead to unjust algorithmic discrimination and loss of anonymity, resulting in undemocratic shifts in power. 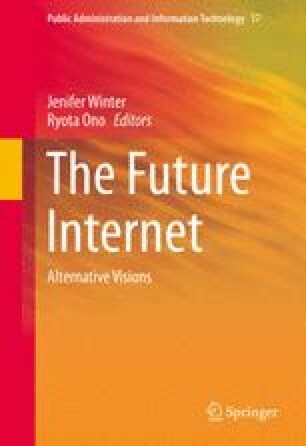 Three alternative scenarios for the future Internet are presented as contrasting possibilities to explore key uncertainties about the future for the year 2045. Because the framework for the future Internet is already developed and numerous aspects of it are already appearing around us, it is essential that we critically examine these systems and associated narratives in order to stimulate meaningful discussion and design policies and systems that respect citizen concerns. By examining and testing alternative visions of the future Internet, we can more closely align its development with ethical, human-centered insight.